Low mileage should be at the top of your checklist on your hunt for the perfect used car for your needs, as it signifies less wear and tear, a healthier transmission, and better resale value. If you’ve been on the hunt for the best pricing on low mileage used cars for sale in Washington Court House, OH, your search ends at Gusweiler Toyota’s diverse lot and competitive finance department. Jimmy G's price $31856!!! Come and get this 2016 Highlander XLE!!! This is a one-owner that we sold new! This SUV features heated leather seats, navigation, push-button start, and a power liftgate! This will not last long! Plus it's backed by Toyota's certified warranty. The best new cars make the best used cars! Jimmy G's price $34995!!! Hurry in to get this 2016 Toyota 4 Runner SR5. We sold this 4 Runner new and have serviced it. No one knows this 4 Runner better than us! It has navigation, four-wheel-drive, alloy wheels, and fog lights. Plus it's backed by Toyota's certified warranty. The best new cars make the best used cars. These are only a few of the reasons to shop with us. Find out about all the perks we can offer you and set-up your test-drive by contacting us today. 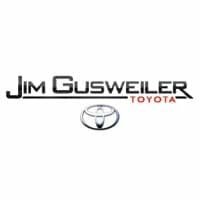 We look forward to showing you the Gusweiler Toyota difference.